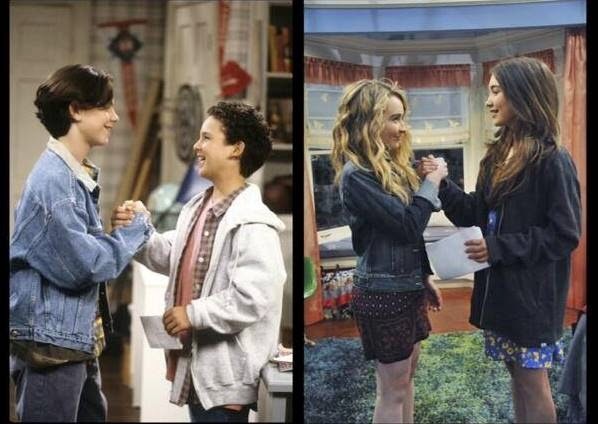 Many fans hoped that Girl Meets World would be just like its predecessor, Boy Meets World, only with females as the center of the show. In many ways, it is, and not every parallel is an easy one... having a paper plane in the theme song and a stylized Earth in the "O" of Girl Meets World come easy, as does naming Riley's school John Quincy Adams Middle (Cory attended John Adams). Having Riley and her friend sneak out a window, however, is tougher, as instead of a woody area of Philadelphia, this generation of Matthews lives in the West Village, so a treehouse becomes a fire escape. In watching this spin-off, however, viewers might begin to wonder how much of facsimile will really work, though. At school, Riley has her best friend Maya by her side (Cory's Shawn) and deals with Farkle, the class dork crushing on her (Minkus always wanting to hang out with Cory and Shawn), while at home, she has to deal with her weird brother (Auggie as Eric). From previews, we know that there will be generational differences (mobile devices, ahoy! ), but how many ways will this series really deviate from the classic 90s family comedy? Already in the pilot, we see the storyline of Cory fighting for the independence to drive a car at sixteen, but Riley sees her nearly-earned her MetroCard as that mark. It's apparent that her personality is design to be just like Cory's, with his anxious behavior, poor lying ability, nervous laugh, deep desire to be cool, and naivety. Maya mirrors BFF Shawn's relaxed demeanor, carefree attitude, and rebellious side. [her smile is a lot like the one Rider Strong always flashed, too.] We'll be here to ride out this series and continue to point out where it's keeping pace with the beloved ABC program and where it runs off the rails.